Cofra have designed a range of retractable devices designed to arrest falls, Retractable device with a 4.8 mm diameter zinc-plated steel cable and a fibreglass reinforced nylon protective carter with integrated braking system. The ergonomic carter has a handle for easy carrying and assembly. 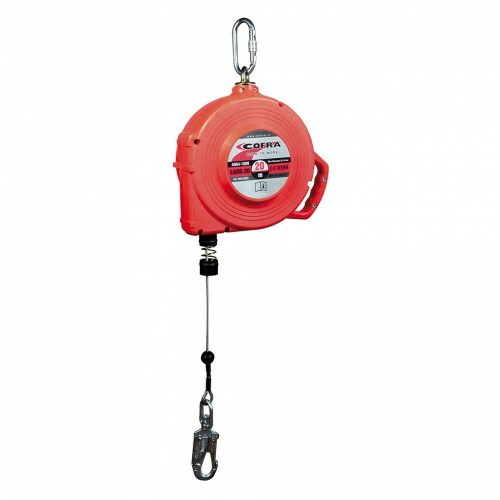 For added safety there is a double SWIVEL anti rope-twist system, one placed on the anchorage point and the other on the automatic lever end connector with fall indicator. The fall indicator is activated automatically when a load of approximately 2.5 kN is reached. The SWIVEL system prevents the strap from twisting around itself, avoiding the sudden blockage of the device and enabling the user to work with complete freedom of movement. The fall indicator improves the user’s safety by displaying whether or not the device can still be used.. The additional test regulated by VG 11 CNB/P/11.062 certifies the resistance of COFRA retractable devices at a maximum nominal load of 150 kg, compared with the 100 kg of other retractable devices on the market, ertified according to current base standard EN 360.